One motherly lady, a pot of simmering stew, a ladle of love later, I became an Ethiopian food convert. 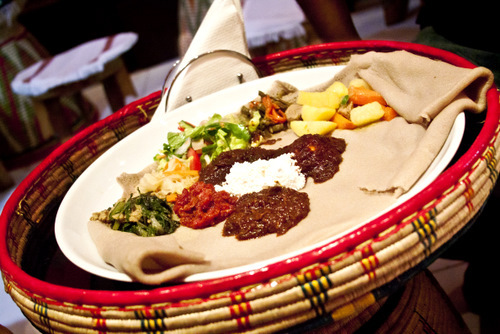 In 2011, I published a post called: Anyone out there found yummy Ethiopian food? I’ve never been wild about Ethiopian food. Not when I tried it in Philadelphia for the first time, nor the second time, nor even the blithering third time. And definitely not when I attempted to order take-out from an Ethiopian place buried somewhere on Naif Road in Deira. What was I thinking…let alone unappetizing, my aluminium wrapped Ethiopian take-out actually seemed somewhat lethal. Still, I wanted to give [unnamed restaurant] a chance. There’s always that tenth time that can totally change your opinion about something – and I’m ready for my tummy to take the hit those nine times prior. This clearly was not that life-changing tenth time. The reason that this was a Terrible Post was because at the time, (a) I based my experience on assorted platters of alien curries over a bed of spongy fermented injera bread. Mixed platters are ironically the worst way to learn about a foreign cuisine. All the flavours get muddled up, I’m too busy trying to guess what every dish is rather than knowing the names beforehand, and I end up walking away from the meal with the dishes I didn't love dampening out the ones I did—all of it creating an experience of forgettable mediocrity. It’s the bumbling buffet phenomenon: taste a little of everything, walk away remembering nothing. 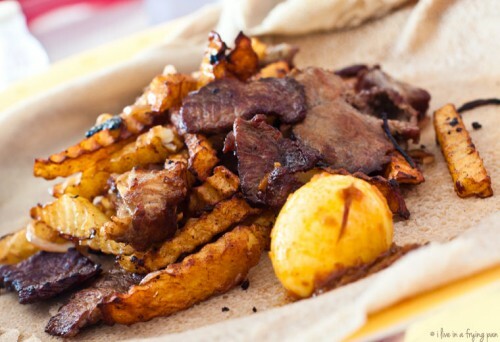 And (b) Ethiopian takeout of certain dishes is an incredibly stupid idea. Obviously, my one takeout experience had honed in on one of those Certain Dishes. In 2012, my opinion dramatically changed. 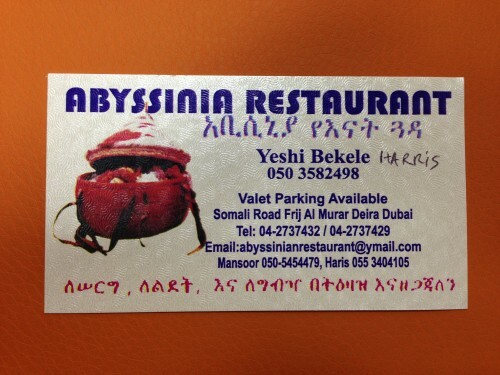 It happened when I accompanied a Dubai One TV shoot to Al Habasha, an Ethiopian restaurant in Abu Hail. I had visited Habasha once in the past, but as always, had not walked away with any memorable experience that left me inspired to blog. At the time of the TV shoot, the owner Sara was there to show us how to make Doro Watt — a hearty Ethiopian stew with chicken, eggs, a special sour-spicy berbere spice mix, and nitter kibbeh, a spiced butter. Here's the video link (which my rebellious blog is refusing to let me embed in here) - http://www.youtube.com/watch?v=SwkpRhhMEfM&feature=youtu.be - forward it up to 1:16:00 to watch Sara in action. 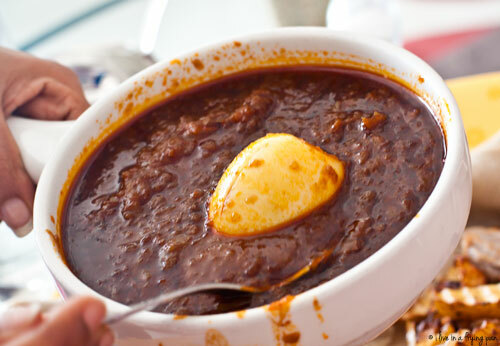 It was over the tangy aroma wafting up from the pot of fresh Doro Watt that I finally started soaking in flavours that up until that time, had been completely alien to me. Watching Sara make the stew using her mother’s recipe somehow connected me to it in a way that I just couldn’t when I tried to sample the food alone. The latter is like visiting China, making the wrong food choices or even a few good ones, all of which eventually languish in a sea of anonymity that quickly washes mealtime memories out of your mind. The experience with Sara made me understand, value, and taste the food in a way that my taste buds couldn’t process earlier. 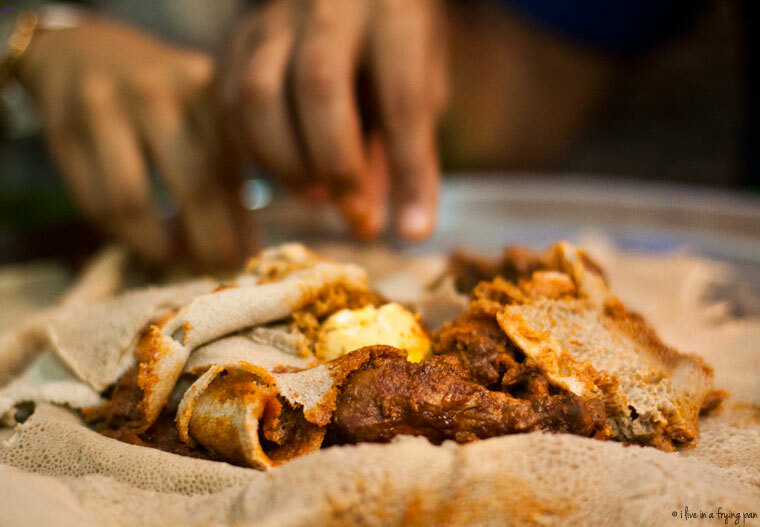 For instance, injera, whose rag-like appearance never struck me as appetizing in the past, suddenly became the perfect spongy complement with which to sop up the curry. The strong fermented taste of this teff flour bread is an acquired one, but one that was easily acquired after I found the perfect stew to soak up its hive-like pores. This was finally that life-changing moment when I’d start appreciating Ethiopian cuisine. I reckon that much of it is the Grandmother Effect. I don’t think I’ve ever heard anyone say: I despise my grandmother’s cooking. Yet I find it hard to believe that every lady two generations ago was a fabulous cook. There’s just something about knowing the person who’s making the food, seeing them go that extra mile to serve you with love, that makes the flavours more accessible, memorable, and strangely, more tasty. If the heart falls in love with what’s being served, it’s likely that your stomach will too. A few days ago, I enjoyed a lamb version of the stew (Yebeg Key Wot) at the Abesinian Restaurant in Deira. Once again, the combination of sour, spicy and fermented just hit a spot that didn’t even exist up until last year. Tender chunks of bone-in lamb immersed in this absolutely addictive berbere curry laced with the distinct buttery flavours of nitter kibbeh. The meat was plump with curry juices, and I snatched the bone marrow, reserving the tender innards for my own selfish pleasure. Every time the spice level turned my wimp taps on, I turned them back off with nibbles of aib, the fresh cottage cheese served alongside to extinguish the flames. I couldn’t stop eating, to the point where when I stood up, I literally had to hang down like a bent-over spineless scarecrow – a very fat scarecrow – that just didn’t have the will to move an inch. Even the kara mara tibs made me grab for second rounds. The dish was chock full of meaty strips—lamb? beef?—that had been charred beyond recognition. These cousins of jerky were drumming the beats of potent green chillies, stolen from the slit whole chillies scattered menacingly across the dish. Had the chillies been chopped finely, I’d have run miles from the dish. But leaving them whole imparted their sharp, nostril-tickling aroma to the dish, thankfully without the scorching bite. We left Abesinian on a more-than-satisfied note. Each of the dishes were flavourful in their own way (though the Yebeg Key Wot won my heart), and once again, I had connected with the lady of the restaurant who patiently explained every dish and even left my friend with a little tub of teff grain so that he could attempt to grow it at home. I say all the time that [my mother’s Spanish potato and egg tortilla] is my favourite because it conveys a point: that sentimental value comes above all else. Multiple Branches, but I visit the one in Abu Hail which I’ve plotted on my trusty Google map. 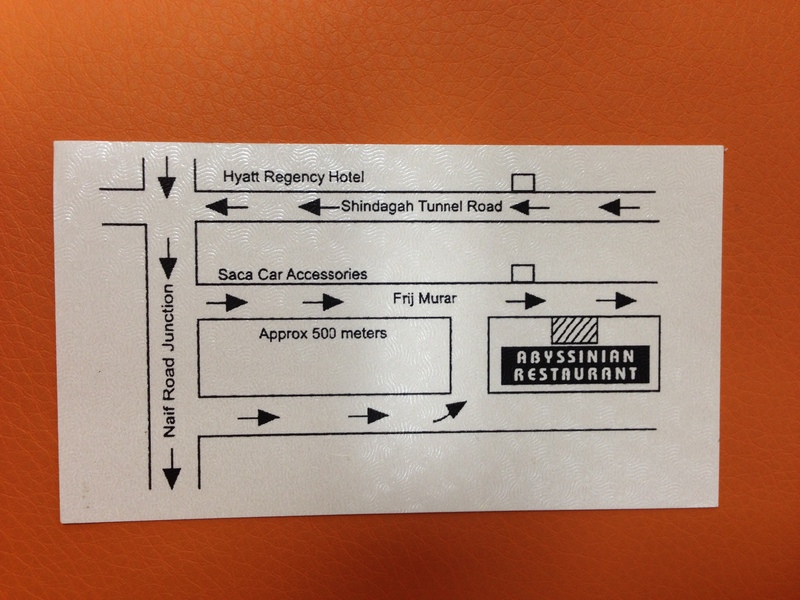 Thanks to Dileep Cherian who visited the restaurant and so sent me a photo of their business card and map [BROWNIE POINTS TO YOU BOY!! 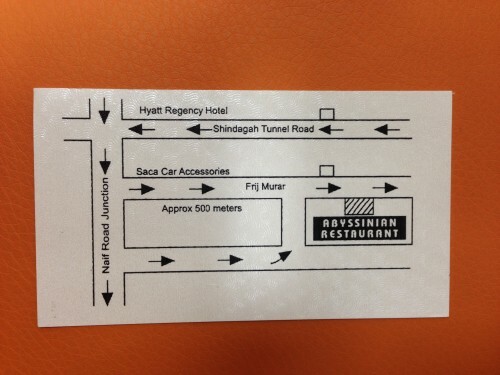 ], we're now not so directionless when it comes to locating this hidden restaurant. His tip to finding the place: "It's on Somali Street, the lane behind Mashreq Bank. It's on the same road as Al Noor Hotel. " You rock Dileep, if I could build you a castle of injera to show my appreciation, I totally would. 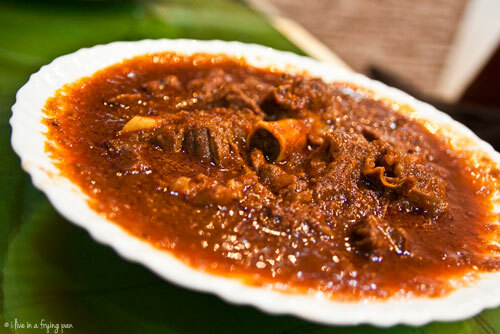 ← Older: Maharashtrian Food at Peshwa Kisses My Sleeping Beauty Blog Awake. You’ve certainly gone through a transcendent culinary experience! It took my husband (Scotch) a few years of trying pungent Chinese dishes before he finally began to appreciate the cuisine at its best. I’m glad you found finally found your appreciation of Ethiopian food – I have only been to Abesinian and loved everything I tried there. @gingerandscotch:disqus – yes, it took a long, long time for me to appreciate the food. But it’s finally happened, and now the love for the cuisine is here to stay! Sizzler, I’m so happy to read this post… you are in your elements. Am glad that your sleeping beauty blog is awake. I can only say that your writing is so, so, so incredibly sensitive and detailed, that sometimes I start to think food from your post’s perspective. Giving a chance to an unappetizing looking Injera… I have a lot of catching up to do on the food tasting front. Good wishes to you, always. I think disqus wiped my last comment. 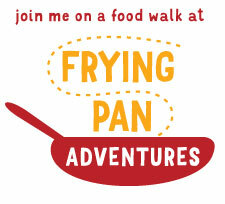 So sorry short second one – thanks for introducing me to cuisines I know nothing about. 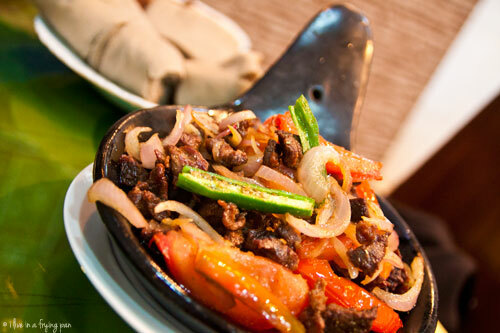 A friend ordered Ethiopian food for a party and she hated it, which I always thought strange given large community here. @google-e765094276c1ae4f8a701898fc8a87f4:disqus – Sorry to hear about your friend’s experience. Wonder if it was a massive takeout thing, or had they actually had it cooked and served at the party itself? Either way, it’s worth going to one of these two places to try!